Before you watch the first episode, here's everything you want to know about format of The Kapil Sharma Show. Kapil Sharma will play the role of a jobless man Kappu. He and his gang members will the be the residents of Shantivan Non-cooperative Housing Society. Ali Asgar, who vowed never to play Dadi again on TV, will be playing the role of a blind Nani in The Kapil Sharma Show. Sunil Grover will play Dr Mushhoor Gulati, apart from other characters. Nani has apparently gone blind after an unsuccessful cataract operation performed by him. While Shah Rukh Khan will grace the first episode of The Kapil Sharma Show, Tiger Shroff and Shraddha Kapoor will appear next. Honey Singh will also appear soon. Sumona Chakravarty will be seen working at Dr. Gulati's clinic, while Rochelle Maria Rao will be a nurse at the same clinic. Kiku Sharda will play different characters in different episodes. Yes everyone is exited to watch Kapil once again. The next person you will see on The Kapil Sharma Show will not be a movie star or singer but ace badminton player Saina Nehwal with her family. She will appear on the Saturday Show. Brett Lee is back in India but not to promote a cricket tournament. This time it’s for a film he’s playing the lead in, titled UnIndian. 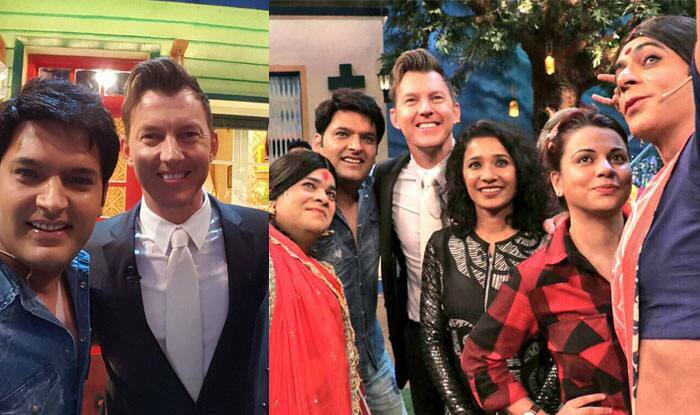 The cricketer turned actor was accompanied by the film’s director Anupam Sharma and Tannishtha Chatterjee on the sets of The Kapil Sharma Show. wow!!! very excited to see Brett Lee in this show. The whole Kapil Sharma and Sunil Grover fiasco have reached a point where we have stopped caring. The spat on the airplane turned into a full-fledged feud with the team choosing sides. Channel too had to intervene.